Pisa, 17th January 2019. Subcellular, nanoscopic, dynamic structures or compartments, such as vesicles, organelles or entire cellular protrusions are key effectors of cell-life regulation. Yet, our ability to study their biochemistry in living cells is severely challenged by their restless, rapid movement in the 3D cellular environment. The research has been performed at the NEST Laboratory of SNS by Filippo Begarani (PhD student at SNS), Giovanni Signore and Fabio Beltram, in strict collaboration with people from the IIT-CNI@NEST (Francesca D’Autilia), the CNR-Nano@NEST (Marco Cecchini and Ambra Del Grosso), the Laboratory for Fluorescence Dynamics at UCI, US (Enrico Gratton). Results are published in ACS Nano. More in detail, the authors selected the lysosome as a target intracellular organelle. 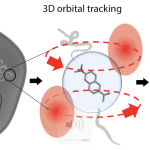 By using the orbital tracking approach, and exploiting the signal of a lysosome-specific environmental probe, they were able to probe the fingerprint of metabolic reactions ongoing in the lysosome lumen, during natural organelle trafficking. These appear as fluctuations in time of the lysosome-lumen polarity, a crucial physicochemical property of any biological environment. Begarani and co-workers demonstrated that polarity fluctuations are characteristic of living cells, depend on the organelle pH and metabolic energy, and are altered in a cellular model of lysosomal storage disorder (LSD).